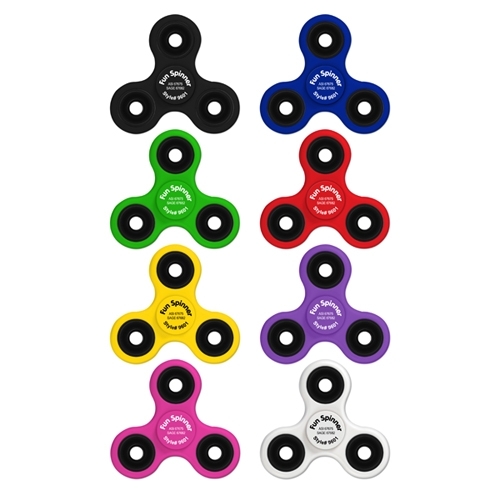 Liqui-Mark’s NEW Fun Spinner fidget toy and stress reliever is made of ABS plastic in 6 colors to choose providing a long spinning experience. Approximate spinning time is 2 minutes. WARNING: Choking Hazard – Small parts. Not for Children under 12 years. Color Selection: Black, Blue, Green, Red, Pink, White, Yellow and Purple. PMS Color Match: $30.00(g) per color. Additional Color Imprint: Add $0.25(g) Per additional color. Standard Production Time: 4-6 working days for catalog quantities. Do not include holiday closings in production time. Product Dimensions: 3" x 3"